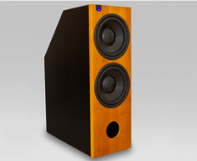 Designed as the perfect powered subwoofer for the KS Digital ADM20 studio speakers. The ADM W was designed to mate with the ADM20 nearfield monitor, creating the perfect 3-way speaker system for mixing and studio mastering. With a frequency response from 25 to 100Hz, this powerful sub can handle all the low end dynamics your music needs. 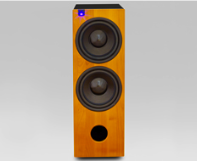 It also acts as a speaker stand for the ADM20, which presents a "wall of sound" unheard of in a nearfield / sub system before. With the combination of the ADM20 and ADM W, there is no longer a separation between nearfield and sub, where the frequency range and dynamics are completely mismatched. No longer will you hear low end by itself, with the upper frequencies disjointed and projected on a different plane. This unified studio monitoring system solves all issues of phase alignment and dynamic response because the ADM20 handles all processing through its own Firtec DSP... another industry first! 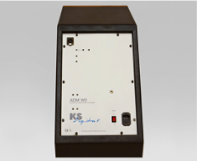 The KS Digital ADM W is a self-powered, incredibly powerful sub. Contained inside are two 10" carbon fiber drivers, providing amazingly articulated low end. With 400W of power and a peak level of 125dB SPL, the ADM W can handle anything you throw at it. From the extreme low frequencies of hip hop to hearing the lowest range of the orchestral timpani, everything in the deep low end is revealed in complete phase and dynamic alignment when combined with the ADM20 nearfield. This gives you the most sonically accurate presentation of your music available today in a nearfield and powered subwoofer combination... revealing the sonic truth. Mount the ADM20 on top, plug in one cable, turn it on. Set up couldn't be any faster or easier than with the ADM W. Since the ADM20's Firtec DSP handles all the details, you simply plug the analog out from the ADM20 to the analog input of the ADM W. The sub output can be switched off or on via the ADM20 remote, and sub level can be set there as well. Fine controls for level can also be set on the ADM W itself, so you can get the exact level of sub frequencies you desire for your style of mixing. As with all KS studio monitoring, the KS Digital ADM W studio subwoofer is hand-built for you in Germany and comes with a signed Certificate of Authenticity, as well as a full 2-year warranty. Dimensions H 90 x W 30 x D 65 cm, 35.5" x 12" x 25.5"